I'm participating in the August Camp NaNoWriMo. That's the second time I'm joining the writing month (and I haven't finished writing for my June's camp...) So, I'm starting a new story but it's a fan fiction for now. I have not planned anything for this story and I'm going to just write whatever that comes into my mind. I tend to get disheartened by outlines for some reason. Turns out that progress is a little faster than writing with an outline! So I guess I'm heading in the right direction. 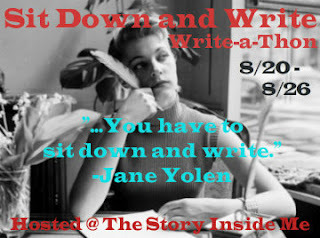 By the way, you don't have to be writing a story to join this write-a-thon! You can also write book reviews or even thesis! Just write anything! Starting and end times are the usual: Monday (8/20) 12:01am CST until Sunday (8/26) 11:59pm CST.